I meant to post about this yesterday but I was a wee bit under the weather. Okay, a lot under the weather. I was more than a little flattered that thekitchn.com approached me about doing a guest post about my favorite weekend snack. It did take much thinking to come up with this one. I am re-posting this with a few additional pictures. Living 3,000 miles away from home can be hard on your heart. Not to mention your stomach. Do you ever crave something that you can only get in one place? In my case, I miss the Italian Sub from the White House Sub Shop on Arctic Avenue in Atlantic City. In New Jersey subs are a way of life. There is something about the combination of Italian meats, Provolone cheese, Jersey tomatoes, onions, oregano, oil and vinegar, and the bread. Oh, the bread. You cannot get bread like this anywhere else in the world. But that does not mean that you cannot appease your craving. And this little baby is just that. This deconstructed Italian Sub is a far enough departure from the real thing that you get the flavors that you crave without being disappointed. I went to my neighborhood grocery store and looked around for the ingredients I needed to make this dip. I asked the man at the deli counter for Capicola and he looked at me with a puzzled look on his face. Okay, imported ham it is. I searched high and low for hot pepper spread. Nowhere to be found. I found a jar of hot cherry peppers and heard Tim Gunn’s voice in my head. “Make it work”. I went home and put the cherry peppers in the food processor and it looked, tasted, and smelled like a New Jersey sub shop. 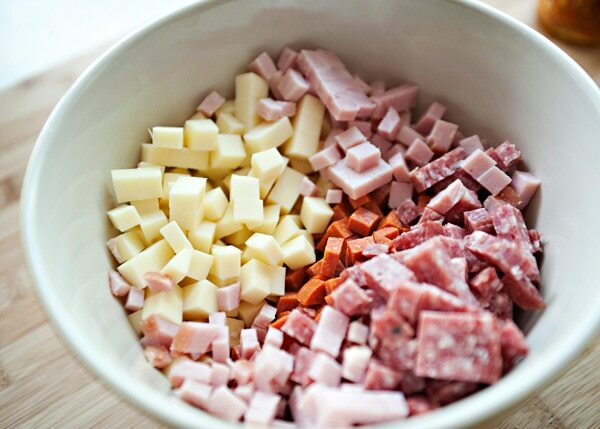 I chopped my meats and cheeses and my mouth started to water. Thankfully, my husband was not home while I was making this, because if he could smell Italian Sub on me I very well might have ended up with another baby. It smells that good. There is no way that I could ever make or find a bread like the bread that an Italian Sub comes on so I had to come up with something different. I love this focaccia recipe because I have made it a hundred times and a hundred times it has been delicious. It is a foolproof bread recipe. If you are scared of breadmaking, this is a great recipe to start with. I keep this focaccia very basic because I do not want it to compete with the dip, but you could do a million things with this recipe. This is a favorite snack in our house because it is easy to make, tastes even better the next day, and reminds me so much of home. It is comforting and feels like a mother’s hug. One of the reasons that I think this dip is so delicious is that every component gets a chance to shine. It is perfect to make and eat in the afternoon while watching a football game with a cold beer or to serve at a summer barbeque. I will admit, it is not the prettiest appetizer that I have ever served my guests, but it is by far the most requested. Cube the meats and cheese into small cubes. 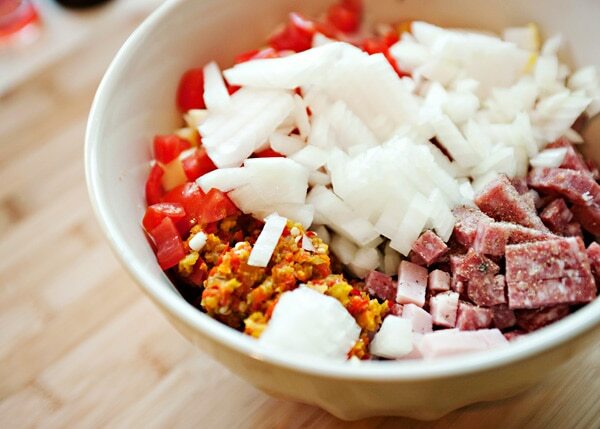 Put it in a bowl and add the chopped tomatoes, and onions. Add in the hot pepper spread and oregano. Season well with salt and pepper. Combine well and chill. Let the flavors combine for an hour or overnight. Right before you are going to serve, toss in the Iceberg lettuce. Serve with toasted bread. In the bowl of a stand mixer proof the yeast with the sugar and warm water. Let stand 3 minutes until foamy. Turn the mixer to low and add the flour. Dissolve the salt in 2 tablespoons of warm water and add this to the bowl. Pour in the olive oil. When the dough starts to come together turn the mixer to medium and mix until smooth, about 10 minutes. Periodically, stop the machine and pull the dough off. The dough should be elastic and smooth. Place the dough in a bowl coated with oil. Cover with a towel and let rise until doubled in size, about 45 minutes to an hour. Lightly coat a baking sheet with oil. Roll out into desired shape. Place on sheet and let sit for 15 minutes. Bake in a preheated 400 degree oven for 15 to 20 minutes. Thank you to thekitchn.com for having me this weekend. It was a pleasure. This sub sounds fantastic. I love all the fresh ingredients. There is an Italian market pretty close by my apartment, so I will go there to look for capicola. Thanks for sharing this great recipe, and congrats on being spotlighted on The Kitchn! I just stumbled onto your blog and decided to look around. I’m glad I clicked on this post! I’m from EHT, NJ and spent most of my childhood in Atlantic City at my grandmothers, right next door to The White House! I love all of their subs. Its sad that you’re so far away and don’t get to enjoy the yummy-ness of a South Jersey sub anymore! what a small world! I cannot wait to make the trip home this summer to eat some South Jersey grub. Just found your blog……um WOW! Look at this recipe! You’ve pleased this Italian girl, I’ll be keeping track of your blog from now on. Yum!! please do! thank you for reading. I cannot wait to try this! As an app for 4 people, do you suggest doubling the recipe? Thank you! No, I think that it is enough. It is pretty filling, all protein. Maybe I over looked it. How do you make the hot pepper spread? I love it! However, I have been missing it in my life since I left PA 5 years ago. I bought some deli peppers and put it in the food processor. Even finding the peppers was hard. When I asked in the store, the gentleman had no idea what I was talking about. If you have a Lenny’s sub shop in your area, they have a Hot Pepper Relish that is really good. And, they sell it in jars. Oh, great recipe by the way. I’ll have to check and see if we do. Thanks for the suggestion. 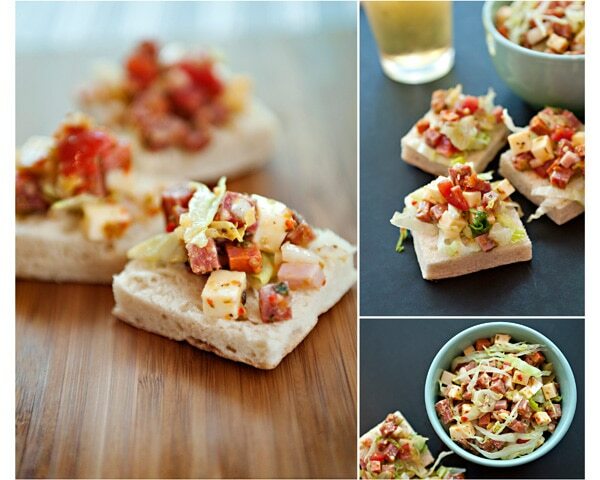 Came accross your blog and this delicious looking recipe. I can almost taste it now!! 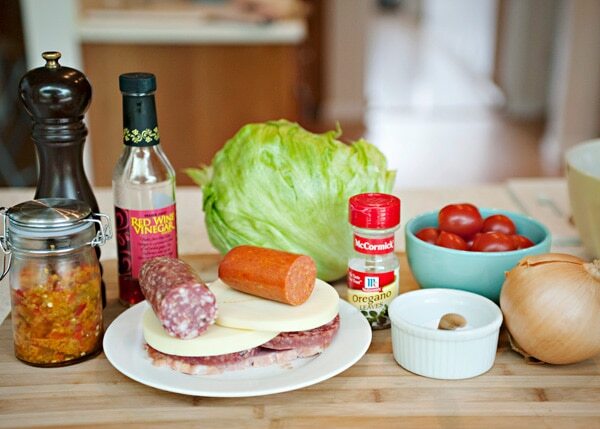 Looks pretty easy (and I have all the ingredients) except the red pepper sauce, however, I have seen it in speciality stores–that would do OK, right?? Also, I could BUY the foccaia right or just toast some small bread rounds, huh?? Hey! I am a busy lady! LOL– Wish I had it right now!! Thanks! And bring some more good Italian quick recipes! You an absolutely buy focaccia or toast some bread. I couldn’t find the pepper spread either, so I just pureed some deli peppers. This recipe is amazing! I made it yesterday for my 5 year old’s birthday party, and everyone loved it. Thank you for posting! awesome! glad that everyone loved it. My friend made this on Saturday night and it was so good! We didn’t know what pepper spread was, so she used Giardiniera. It gave it a good kick and was so tasty! Glad that you all liked it. This looks amazing! I live in PA, and we have many pizza/sub shops owned by Jersey folks, and my favorite thing in the world is an italian sub. I can’t wait to make this. I keep saying I’m going to wait until the super bowl… but I’m not sure I can! 🙂 thanks for what looks like an amazing recipe! You and my husband! His second favorite food. hi I am wondering what is the hot pepper spread? is there a particular brand that has this that I should look for? No, it is sometimes called hoagie spread. It is usually with the olives. I can not begin to express to you how good this sounds right now. I seriously wish I was not dieting. I’m definitely bookmarking this one for sometime in the future. Hey there, i just happened upon this recipe and intend to make it for a tailgating party on Saturday, how many does it serve? Debating on if I should double the recipe or not? There will be about 20 of us.